The IRS has $11,638 of YOUR MONEY. Wouldn’t it be great if your accountants occasionally came to you with exciting new ways to save money? Well, that’s what Small Business Tax Strategies does every month. One government study found that the average small business overpays its taxes by $11,638. That’s money you could be plowing back into your business or spending on your family. You’ll never know how much money you’re missing out on until you give Small Business Tax Strategies a try. Remember – for every dollar you earn, you keep only 60 cents or so. But when you shave a dollar off your taxes, that whole dollar goes in your pocket. Join the thousands of other small business owners who rely on our trusted advice. We’ll wring every dollar of savings out of the tax code for you … supplying you with a steady stream of found cash that will slip through your fingers, unless you take the simple steps we outline for you every month. Bonus Special Report #1: Surprise Tax Windfall for Small Business Owners – a $39.95 value, yours FREE! If you own or manage a small business, you can double or triple your real income. By staking your claim now, you can take your share of this huge tax-saving windfall. From shifting your income to distributing your assets, this invaluable guide includes 89 of our all-time favorite tax tips. 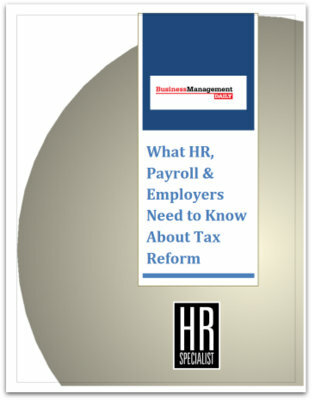 Bonus Special Report #2: What HR, Payroll & Employers Need to Know About Tax Reform – a $39.95 value, yours FREE! The Tax Cuts and Jobs Act introduced in 2017 will have a far-reaching impact on both employers and employees. This report, authored by payroll expert Alice Gilman, editor of Payroll Legal Alert, offers a detailed breakdown of the first major overhaul of the U.S. tax code in more than 30 years. Bonus Special Report #3: Book of Trusts – a $49.95 value, yours FREE! Trusts aren’t just for the super-wealthy, or for tax savings alone. They also help you ensure your estate is managed the way YOU want it to be. This report will help you choose the right trust and apply the latest tax law changes to your estate plan. It’s a guide to 13 of the most effective and most used trusts. It can help you choose the one that suits your needs – and the needs of your beneficiaries – the best. Subscribers tell us that Small Business Tax Strategies is like having their own personal tax adviser on staff. Take a few minutes to review our sample issue and see for yourself how Small Business Tax Strategies can put 20% of your next tax bill back in your pocket. Then, start your risk-free service today! P.S. 100% Risk-Free Guarantee: If Small Business Tax Strategies doesn’t knock at least 20% off your next tax bill, or if you’re not satisfied for any reason, we will immediately issue you a full, 100% refund – no questions asked. The issues (and free bonus gifts) you have received are yours to keep. It’s our way of saying “thanks” for giving Small Business Tax Strategies a try. You risk nothing!